Pulp and paper mills need large amounts of water for nearly all stages of production such as the cooking and bleaching of pulp, as well as the preparation of the stock prior to the paper machine. Raw water is usually taken from lakes or rivers. Especially in spring and fall, higher organic loads are present in these waters, causing a slight yellowness. This color has to be removed before the water can be used in the plant. The decolorization of raw water can be accomplished by different methods, such as adding alums or by the absorption of activated carbon. To optimize the performance of water treatment plants, the degree of yellowness (APHA/Hazen Color) should be monitored using optek’s inline colorimeters. Specifcally, the AF26 inline sensor can perform this task continuously and reliably, allowing the treatment plant to dose the decolorization agent in a controlled and optimal manner. optek dual channel sensors ensure that color measurements are independent from varying particulate levels or background turbidity. The first wavelength detects color, whereas the secondary wavelength compensates for background influences. The optek C4000 converter is capable of reporting different color scales. 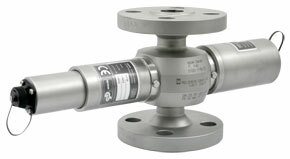 Optionally, a secondary sensor measuring turbidity may be connected to the same converter. This gives two simultaneous measurements with one converter.